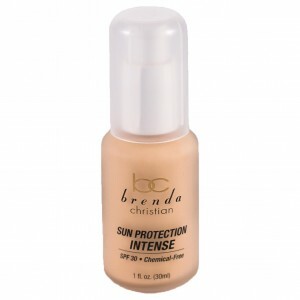 Brenda Christian’s Sun Protection Intense combines total sun block protection (SPF 30, chemical free) with gentle moisturizers which stay in place during daily activities as well as sporting events. Does not burn the skin when perspiring and will not run. Sun Protection Intense is designed to be worn daily for optimal sun protection. Because of its intended frequency usage, the formula does not contain heavy emollients that can cause an uneven dispersion of the natural sunscreens. Color will adjust when applied to skin. Do not forget to apply to scalp and tops of ears when playing golf or tennis. Perfect for men, women and children. The tint, which becomes invisible after application to the skin, is the perfect way to assure total sun safety. Can be worn alone, daily under makeup for women, or even as an after-shave balm for men (calming Zinc Oxide is wonderfully soothing to skin). Apply one or two pumps to the palm of hand. With fingertips of other hand, stipple Sun Protection Intense over face, neck and top of ears.